Eaton Electric Company Inc. has been serving Gainesville and surrounding communities for more than a quarter of a century. This vast experience makes Craig Eaton both professional and highly knowledgeable when it comes to either residential or commercial service work. At Eaton Electric, we are experts in remodels and additions – whether that’s in the kitchen, bathroom, master bedroom or any other room in the house. We like to share our knowledge by providing advice and quality workmanship from start to finish on every aspect of an electrical upgrade to your addition or remodeling project. We work closely with Gainesville Realtors and real-estate sales professionals and can solve all electrical issues that arise during real-estate inspections. On the commercial side, we serve small businesses with lighting maintenance, computer circuits, security lighting, exit and emergency lighting, as well as installing new outlets to meet the demands of any workspace. You will not be disappointed with our competence and service. 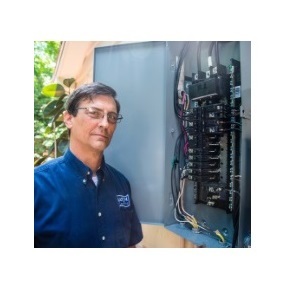 When you need a superb Gainesville electrical contractor, don’t hesitate to call Eaton Electric Company Inc. Our trained professionals can help you with any problem, big or small and residential or commercial.